13 debut decks from iconic turntable brands | What Hi-Fi? Do you have​ one of these in your attic? First attempts aren’t always notable for their quality – Jennifer Aniston’s major breakthrough role was in Leprechaun, while Blur’s Damon Albarn later called his band’s debut album, Leisure, 'awful'. But sometimes that first effort can set the tone for everything that follows. Take turntable manufacturers, for example - some first attempts continue to define several of the sector's most important brands, even today. Here we've listed 13 of the most impressive debut decks ever to spin a record. Some emerged from a company’s existing knowledge, some kick-started entire companies, and others put their brands properly on the map. In 1973 Rega’s founder Roy Gandy set out to make something structurally solid. According to Rega’s historical records, sound quality was secondary at that time (gasp!). Gandy wanted to produce a reliable turntable that he knew would last, but would also look different. “Why can a turntable not have three outrigger points spinning round, that people might buy as a piece of sculpture?” he asked. Thankfully, better overall performance was also soon the goal. And as Gandy took his prototypes to potential manufacturers, the outcome was the Rega Planet, with its three-spoke, steel and aluminium platter and Acos Lustre tonearm. Still going strong 47 years after its inauguration, Linn’s debut turntable has some stamina – even if it has had more updates over its lifetime than Trigger’s broom. The company’s very first product, designed by founder Ivor Tiefenbrun (who argued the source was always the most important part of any system), the LP12 is still one of our all-time favourite decks – which is why we recently visited the company's Glasgow HQ for The Making of: Linn Sondek LP12. Interestingly, the first version came without a plinth, but soon moved to the more recognisable version (pictured). The LP12 remains arguably one of Scotland's finest hi-fi exports ever. While the 1982 GyroDec is probably the company’s signature deck, its first was the Reference Electronic. This deck was hatched from Transcriptor’s Hydraulic Reference, which famously appeared in Stanley Kubrick's A Clockwork Orange. In the late 1960s, Michell GyroDec founder John Michell started manufacturing parts for Transcriptor turntables, eventually making them under licence. When the companies parted ways in 1977, Michell began its own production. And so, the Reference Electronic, which came with a coloured mirror finish or marble plinth, was born. It’s ironic a company now making loudspeakers costing six figures was founded on a shoestring less than 30 years ago. 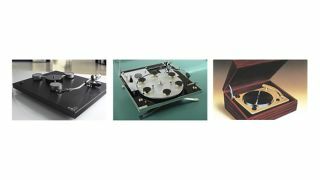 Wilson Benesch dedicated its first year to research and development, and the outcome was the Wilson Benesch Turntable. Clearly the creativity went into the design and not the name. The Turntable featured two world's-firsts: a carbon fibre composite sub-chassis and carbon fibre tonearm, the A.C.T. One. Carbon fibre was used for its torsional stiffness and damping of structural vibration within the system. The material now goes some way to defining the brand, having been used in its designs ever since. Turntable's success allowed Wilson Benesch to reinvest in new product development, paving the way for the company’s first pair of loudspeakers. The Pro-Ject 1 laid the foundations for what has been a virtually unblemished record of success for the company. The 1 was essentially a modified version of the Tesla NC-500, originally made as an affordable turntable for distribution in the Eastern Bloc. After the fall of the Berlin Wall, Pro-Ject founder Heinz Lichtenegger modified a batch to sell in his shop in Vienna. When these proved a success, he re-opened production at the original factory in the Czech Republic. It’s the same factory Pro-Ject turntables are made in today, and still houses the original Tesla machines. With a suspended sub-chassis and an aluminium platter with lead attached underneath, the HW-19 was VPI co-founder Harry Weisfeld’s first work and marked the first chapter of the US company’s story. Three versions followed over the next two decades, during which the design moved to an acrylic platter and acrylic-stainless steel sub-chassis. It's a far cry from the brand's impressive deck aesthetic today. The HW-19 is no longer in production, but upgrades are still available for it. The recently-reviewed SL-1000R, the company's “most premium turntable ever”, is actually a reimagining of the company’s very first deck. Built in 1970, the SP-10 was the first to use a direct-drive system, and it spawned a long line of legendary turntables. The motor rotated at the same speed as the record, therefore eliminating the need for a speed-reducing mechanism (such as a belt) and the mechanical vibrations it caused. In short, direct drive meant lots of torque, instant start-up and excellent speed accuracy. The Clearaudio name might conjure up the classy, matt-black aura of the multi-Award-winning Concept, but the German brand first entered the turntable market several years prior with the Reference. The Reference’s chassis had a resonance-optimised shape, rather than the typical sub-chassis build. Made from acrylic, with brass metal parts (later stainless steel), distinctly placed feet, heavy arm pillars and resonance control weights, the Reference considered materials and geometry at length. And a year later, the more advanced Clearaudio Master Reference brought a new power supply and tonearm, among other developments. NAD’s turntable debut could possibly date back to a 1981 model, but this mystery proved beyond our detective skills - so the 5120 belt-drive turntable goes down as the company's first. Instead of isolating the turntable from external vibrations by placing the rigid unit on rubber feet, NAD instead fixed the platter and tonearm on a separate sub-chassis floating on springs. Unusually, the 5120 originally came with a flat tonearm - though this was soon changed to a conventional design. The NAD 5120 was notable for its interchangeable tonearm assembly, allowing use of more than one cartridge or arm, and its de-coupled, spring-suspended counterweight which absorbed resonance by vibrating at the same frequency. “Despite its ugly ducking looks, this inexpensive deck gives a performance that far exceeds its price,” read the What Hi-Fi? review. Pioneer is renowned for its DJ turntables, but the company's first deck appeared several years before the disc jockey was a thing. Back then it was described as an ‘induction rim-drive’ (ie. an idler-wheel drive) turntable, with a rubber wheel connecting the motor shaft to the edge of the turntable platter. This drive method was later replaced by the popular belt and direct drives. The PLA-1 offered three speeds, weighed 13kg and was priced ¥29,900 (about £190). From 18th-century jewellers to manufacturers of military rangefinders in WW1 and, eventually, turntable manufacturer, Swindon-based Garrard Engineering & Manufacturing Company has some story. Its first deck, the Garrard 301 Transcription Turntable, came in oil- and grease-bearing versions and was used by the BBC’s radio stations (pictured). The equally notable 401 followed in 1965, introducing a redesigned exterior, more powerful motor and different braking speed control and bearing. In 1979, Garrard was bought by Brazilian firm Gradienete and production moved to the other side of the world. Today, British company SME owns the Garrard brand, and is looking to develop the brand further in the near future. Are these the best engineered turntables you can buy? Despite being named after a Persian king, the Xerxes wasn’t the company’s most oddly-named product of the 1980s – that award goes to its 'Hotcakes' speakers. The Xerxes was notable for a number of technical innovations. Its motor twisted on a spindle to even out speed irregularities, and it had a clever suspension system for the platter/sub-platter, using rubber blobs instead of springs. It also made its lightweight platter heavier on the outside, to maximise inertia. Roksan entered a turntable market dominated by the Michell GyroDec and Linn LP12, but we boldly predicted it would give the latter a run for its money. Oracle’s first turntable was simply called ‘Oracle AC’, but is often considered part of the long-spanning Delphi line launched the following year. There were eventually six variants, with the MkV in 1995 seeing bigger developments in its manufacturing. This first belt-drive turntable was competing with the Linn LP12. At $800, they cost roughly the same, but Oracle didn’t use a two-piece platter. Instead the belt ran on a rim located underneath the platter, making it fiddly to change speed manually. The Oracle's sub-chassis was suspended by a three-point mount on stretched springs and, to help eliminate horizontal movement of the suspended platter, its centre of gravity was moved to the same height as the suspension fixings. It also featured a screw-down clamp to pin the record firmly to the mat.